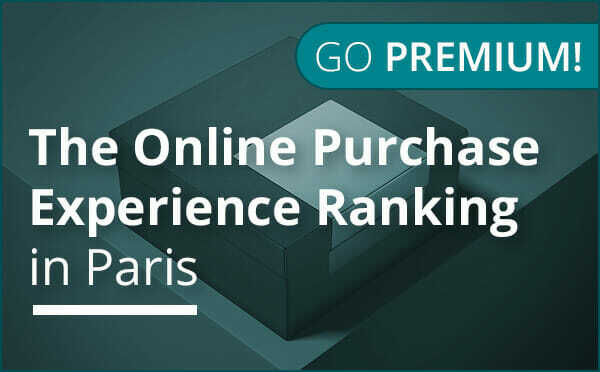 The 3rd edition of this report, conducted by Contactlab and published by Exane BNP Paribas, analyzes the customer experience in Paris throughout the online purchasing process. This year e-commerce site 24 Sèvres hit the Paris market. A digital multi-brand store owned by LVMH, the brand has immediately established itself among the top players thanks to its excellent performance across most of the stages of the customer journey. Our analysists compared the performance of the 34 top fashion & luxury brands, including the 3 biggest e-tailers and the French luxury department store Galeries Lafayette. Published in collaboration with Exane BNP Paribas, the standard report contains an overview of the results from the study. New this year, the premium version of the report includes an in-depth analysis and additional material. Fill out the form on the right to download an extract of the premium version, which includes the key findings, some example tables and the full table of contents accessible if you purchase the full version. The 5th edition of Digital Frontier is out now, the report conducted by Contactlab and published by Exane BNP Paribas, which has been mapping global e-luxury trends for many years. The new Online Offer Dive & Pricing Landscape FW16/17 looks at 32 luxury brands, comparing and evaluating the depth of the online offer as well as price positioning. The report released in collaboration with Exane BNP Paribas, provides a scenario analysis for the growth of the luxury Chinese market in 2017.